Feasibility studies into future gas and mineral projects reveal investment prospects worth over K77 billion (K77.8). 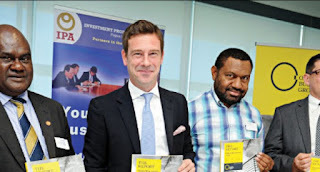 The figure was revealed during the launching of the ‘The Report: Papua New Guinea 2016’ by the Oxford Business Group (OBG). OBG Chief Executive Officer, Andrew Jeffreys, says PNG has a relatively easy task of differentiating itself as a destination of choice for energy majors and commodity investors, given irs unique hydrcarbomn and mining potential. He said delivery of large scale projects creates an enormous buzz in international media and tends to attract smaller investors. “PNG has a formidable pipeline of energy and mining projects to be delivered within the next 10 years. Feasibility studies alone that are available to the public reveal an astonishing 26 billion dollar investment prospect,” he said. The projects cited are the Wafi-Golpu, Frieda Mine, P’nyang Gas Project, and the Papua LNG. The Wafi-Golpu Project in Morobe Province is expected to begin production in 2020, with an initial investment of K6.8 million ($2.3m). The Frieda Mine Project in West Sepik, production of the largest known and undeveloped copper deposit is expected to start in 2024-2025 with a total investment of K17.9 billion ($6 billion). The expansion of the P’nyang Gas Project in Western Province and the Papua LNG will both require investments of K30 billion each.